Choose mushroom logs as an easy and low maintenance method of producing mushrooms for 3-5 years. Logs can be kept indoors, but are mostly placed outdoors in a shady spot where they will be kept moist. Log mushroom growing kits should produce more than a kilogram (two pounds) of mushrooms. What types of mushrooms can I grow in a log? 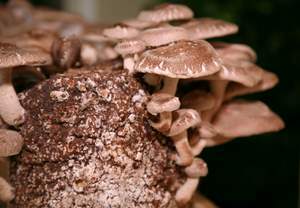 Shiitake mushroom logs and oyster mushroom logs are the most common. Shiitake mushrooms are really high in protein and are excellent immune system strengtheners, even having cancer-fighting properties. Oyster mushrooms are also high in protein (25%) and are excellent in stir-fries. How do mushroom logs work? Logs are inoculated with mushroom spawn. This means that wooden plugs covered with mycelium have been injected into the log, and then covered over with a wax seal to prevent drying out as the mycelium grows into the log. This ‘spawn run’ takes 1-2 years. They can be shocked into fruiting by immersing them in cold water for 24-48 hours. If you leave mushroom logs outside to fruit naturally they may take longer to produce their first mushrooms but they can sprout for many years. Immerse the log in pure, cold water for 48 hours. Cover loosely with plastic to encourage humidity. Keep log damp. If you’re moving your log outside place it in a sheltered shady position. Log should start fruiting within 1-3 weeks. Remove plastic once fruiting starts. If you’re keeping your mushroom log outside select a shaded that is sheltered from the wind. Make sure your log stays damp, ideally it should receive frequent rain. Protect your mushroom log from dogs, cats and slugs. If possible put it where you can see it and won’t forget about it! If you cut the mushrooms off the log so you have a better chance of further harvest. If you have to pull them off, be gentle. After harvest, leave the log to ‘rest’ outside in damp place for 2-3 months as the mycelium extracts more nutrients from the log. After resting, re-soak the log to encourage fruiting to recommence. Logs will continue to fruit if left alone as long as the weather is appropriate but this is not as reliable or predictable as restarting fruiting with a cold soaking. Mushroom logs will usually fruit in Spring and Autumn unless you shock them into fruiting. Logs can fruit for up to 5 years, although 3-4 years is average. Check if you are buying logs that have completed the spawn run and are at the point of fruiting, or whether you need to wait for up to two years for mushrooms. Look for a kit that comes with a soaking tray, wet logs can make a mess! Mushroom growing kits should be removed from packaging as soon as possible, or they go mouldy. Mushroom logs can be kept indoors given the right light and temperature conditions. Many mushroom log sellers offer a ‘guarantee to produce’ – check for this when purchasing your mushroom log. The experts at Lost Creek Mushroom Farm report that sociable shiitakes grow better when they have company! They offer a cheaper deal on a Ma & Pa Shiitake Mushroom Log Kit with Shiitake Sampler Cookbook so that you can grow two lots of shiitakes more productively side by side. Lost Creek also offer a Shiitake Mushroom Gift Basket which contains a 6 inch mushroom log, soup and sauce mixes, dried organic shiitakes and a shiitake cookbook. Great present! Their standard 9-10" Shiitake Mushroom Log is one of the cheapest of the quality offerings available online. The nice thing about purchasing your shiitake mushroom logs from Lost Creek is that they send a percentage of each sale to Mushrooms in Ghana, their project to promote mushroom cultivation as a tool for alleviating poverty in West Africa. Click here for more information on basic mushroom growing kits.